President William H. Taft signed Executive Order sets aside 26,781 acres in southern Florida for the Seminole Indian tribe. Most of the property -- 23,541 acres -- was in Hendry and southwest Brevard counties and comprises the Big Cypress Seminole Indian Reservation. The land was being assembled by the federal government since the late 1800s, as it became apparent that Florida's real estate boom and the draining of the Everglades for agriculture was killing off wildlife and eroding the ability of Seminoles living in the 'Glades to continue to make a living selling skins and pelts. By the end of the Seminole Wars in the late 1800s, the Seminole population in South Florida had dwindled to around 200 staunch traditionalists who had refused the federal government's orders to relocate to reservations west of the Mississippi. Indian Service Inspector Frank C. Churchill summed up the government's intentions in a 1909 report: "It must be admitted from a humanitarian standpoint the Seminoles need looking after to the extent that they be induced to settle down before they become a set of roving vagabounds, as they surely will in a few years if developments in Florida continue." Churchill stated that the federal government must act because "I see no reason to hope that the State of Florida will undertake to do anything for the relief of the Seminoles." 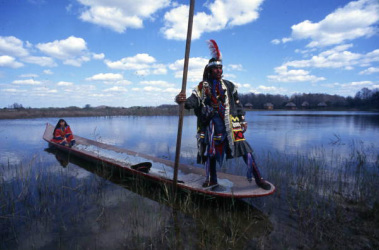 The 81,000 square-mile reservation is the largest of six Seminole reservations in Florida and has a population of 591, according to the 2010 Census. It is home to two tourist attractions -- Billie Swamp Safari and Big Cypress Entertainment Complex. In 1997, the Tribe opened the Ah-Tah-Thi-Ki Seminole Indian Museum on the reservation. Although the Seminoles might be best known now for their ownership of the Hard Rock Hotel and Casino empire, they have also established the 12th-largest cattle operation in the U.S. on the Big Cypress and Brighton reservations.